“Spellcheck” lacks common sense . . .
Howard’s areas of expertise pertaining to restaurant, bar, and food service industry litigation matters include, but are not limited to: Restaurant Slips, Trips & Falls; Premises Liability; Forensic Analysis; Alcohol Liability/Dram Shop; Lost Income; Royalty Disputes; Restaurant Discrimination; Customer Injuries; Wage & Labor Claims; Trade Secrets; Intellectual Property; Restaurant OSHA; Americans with Disabilities Act (ADA); Food Safety & Contamination; Landlord Disputes; Restaurant Equipment; Training Neglect; Employee Injuries; Restaurant Safety & Security; Management Neglect; Franchise Disputes; Harassment; Restaurant Human Resources; Construction; Tip Claims; Restaurant Operations; Partnership Disputes; & More . . . 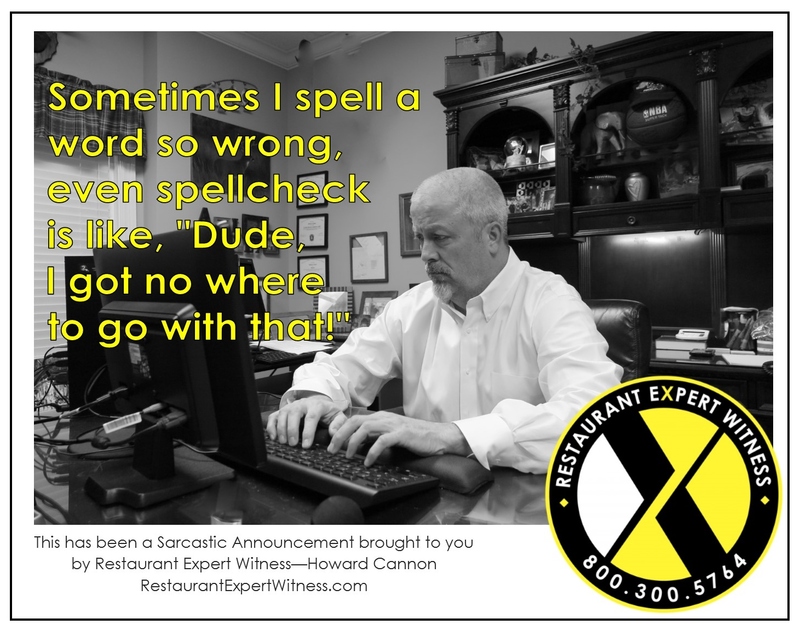 Follow Restaurant Expert Witness on Facebook, LinkedIn, and Youtube.